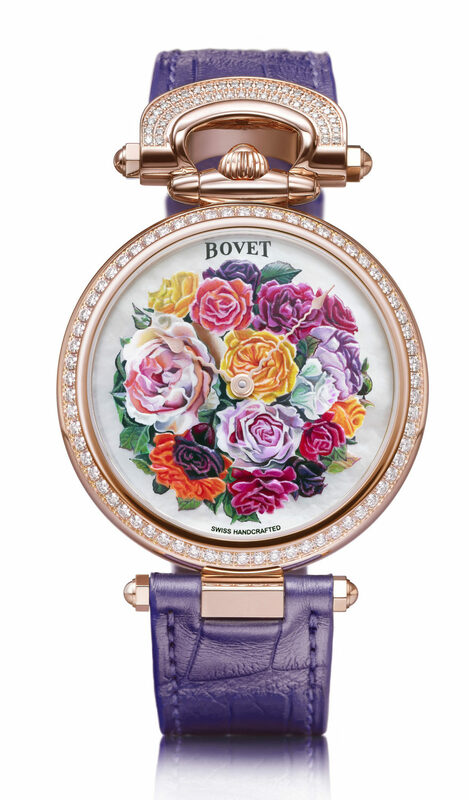 Bovet has created the perfect billionaire’s Valentine’s gift in the form of its latest Château De Môtiers collection. The 40mm watches are housed in 18ct red gold cases adorned with 109 round cut diamonds adding up to a total of 1.31 carats. The watch will instantly warm a partner’s heart thanks to its white mother-of-pearl dial with its miniature painting of a bouquet of flowers. The self-winding 11BA15 movement with 42 hours of power controls simple Bovet style hour and minute hands. It is sold on a purple alligator strap.